Gretchen Rubin interviews the most fascinating people over on The Happiness Project blog. 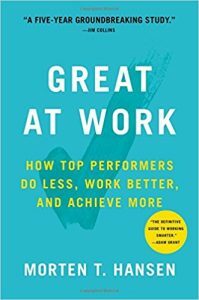 Recently, she spoke with Morten Hansen, co-author of Great by Choice and sole author of Great at Work. 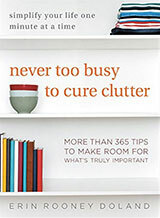 In the latter book, he reveals something that I have championed for years: working more does not mean achieving more. This is something that I’ve known intuitively and have seen in clients and in myself over and over again: it’s all about how you work, not how long you work. Hansen has taken this intuitive sensation of mine and proven it with a study. People who work too many hours a week are actually less productive than those who work less. 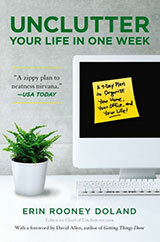 He doesn’t, however, go so far at Tim Ferriss’s The 4-Hour Work Week. Hansen states that to achieve higher than average productivity, it’s important to work hard and work a bit more than the average, but not to work so much as to damage other areas of your life. I learned how to focus on quality not quantity back in high school when I played in the school band. I knew I wasn’t ever going to be a full-time musician (because I was a decent technical player, but couldn’t improvise to save my life). There were times when I practiced an hour or more a day and others when I practiced only a few times a week. I discovered that it didn’t matter which of the two levels I practiced at; I remained at the same level, so of course, I stopped wasting my time and made the conscious decision to practice only a few times a week. It sounds like an easy question, but the answer is hard to calculate. Often you don’t have a choice. You’re contracted to work a specific number of hours and have to do that no matter how productive you are in that time period. Or the culture of your company is one where unpaid overtime is a sign of real commitment regardless of productivity levels (hopefully none of you works in that situation!). According to Hansen, the most productive people put in about 25% time more than the average (50 hours of work instead of the traditional 35), but if someone starts putting in more time, the productivity drops off steeply. My question for everyone, therefore is: How much do you want to achieve your objectives? Are you willing to invest that 25% more time into them than the average person? Can you even quantify that that average time investment is for your objectives? If not, perhaps you might consider making that calculation your top priority. If you drove a truck, as my father did his whole life, how would you apply these suggestions?